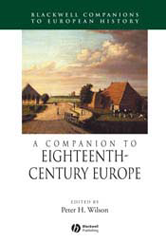 This Companion contains essays by leading international scholars to provide an overview of the key debates on eighteenth-century Europe. Examines the social, intellectual, economic, cultural, and political changes that took place throughout eighteenth-century Europe. Focuses on Europe while placing it within its international context. Considers not just major western European states, but also the often neglected countries of eastern and northern Europe.